The Papermaker's Garden, South Loop Chicago. Established by the artist in collaboration with Columbia College Chicago and Interdisciplinary Arts Graduate Students in 2012. At the Papermaker's Garden 2.0 Opening Community Event, September 2013. The Papermaker's Garden is a site for interdisciplinary art practice, education, and the growing of sustainable fibers in the research of hand paper making and conceptual art practices. 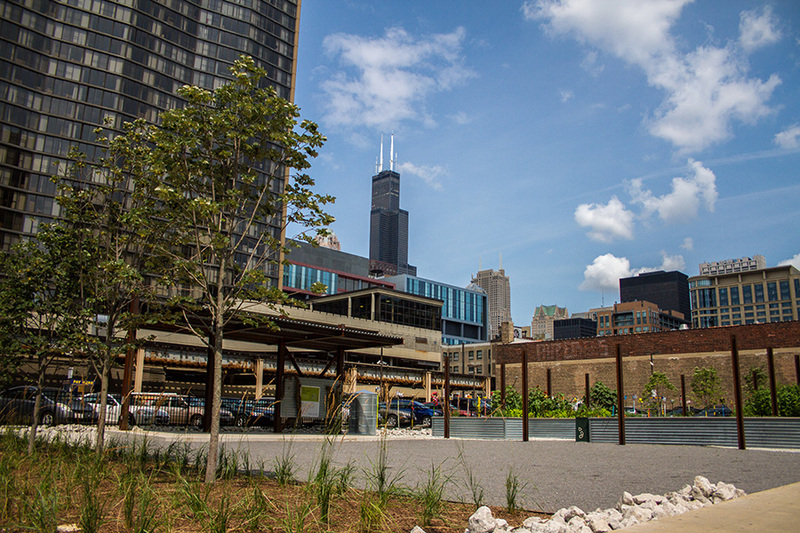 Located in the heart of downtown Chicago, in the South Loop, the award-winning garden is a site where diverse learners and thinkers can explore hands-on urban-outdoor artistic practice in Chicago. It is site for community engagement, artistic research, and the intersection of environmental and artistic practices. The garden is programmed by students and staff at Columbia College Chicago. As the founder of Columbia College Chicago’s Papermaker’s Garden, I have conceived and initiated a true interdisciplinary art practice. The core values of the garden, where environmental sustainability, art education, community, ritual, labor intersect, mirror my own philosophy as an artist and papermaker: I am focused on how the body interacts with its surroundings to become a more complete, holistic, and contemplative being that is connected to the world. Hand papermaking parallels other disciplined, durational approaches to movement, such as athletics, through-hiking, or bikepacking. Sourcing fiber, beating pulp, and pulling sheets are crucial acts of ritual, labor, and a body’s contemplative practice. Founder, Alex Borgen, waters seeds planted by author of On Paper: The Everything of its 2000 year History, Nicholas Basbanes and The Caxton (Bibliophile) Club Officer, Jackie Vossler. Planting for summer 2014, under Matthew Hoffman's You Are Beautiful outdoor sculpture. Matthew Hoffman's You Are Beautiful at The Papermaker's Garden, organized for the winter sculpture park in 2013/14. Students prepare the beds for the first winter in the Papermaker's Garden 1.0 in 2012. We had a successful first summer, and the garden was remodeled in early 2013. Graduate student Chris Bednash’s Installation in Garden 1.0, 2012.